I had an interesting briefing a few weeks ago from Bottlenose, which sells what it calls a real-time “trend intelligence” system. The general idea is almost boringly straightforward: monitor events as they occur and pick out new and interesting information. But the technology to make this happen is mind-bogglingly complex, since it includes real-time ingestion of diverse data types, several levels of natural language processing, and sophisticated trend detection. To give some idea of the scale involved, the company said that simply monitoring “Beyoncé” across social and broadcast media creates 220 billion (with a “b”) data points relating to 2 billion times series tracking more than 100 metrics on 2.5 million entities. The company currently stores trillions (with a "t") of observations for its current dozen or so clients, all big enterprises and agencies including Pepsico, General Motors, Microsoft, Digitas and Razorfish. Bottlenose keeps up with the world pretty much the same way that you and I do: it scans news, social media, and other sources for information, extracts what’s relevant to our needs, and identifies new information or trends that might require some action. But while we humans can only process a tiny amount of information at each stage, Bottlenose works on another level entirely. • Data sources. The system ingests huge swaths of social media, virtually every TV and radio broadcast in the U.S., U.K., and Canada (via automated speech-to-text conversion), Nielsen ratings and audience demographics, and stock market data. It can also accept other market and industry data, as well as a company’s own Web analytics, customer purchases and service interactions. This is all processed in real time, using technologies that handle thousands of messages per second per processor. The system can accept any data format from structured transactions to unstructured text. • Interpretation. Specialized natural language processing extracts entities such as people and topics, identifies concepts and links, and assesses sentiment. This happens without predefined taxonomies or linguistics, although the system does work with nearly 100 rule-based, expansible classes of messages. It appends metadata to entities by matching them with other data sets, such as audience demographics for a TV broadcast. The system maintains profiles on 350 million individuals world-wide, including demographics, cumulative sentiment, language, geography, and social media influence. • Trend identification. 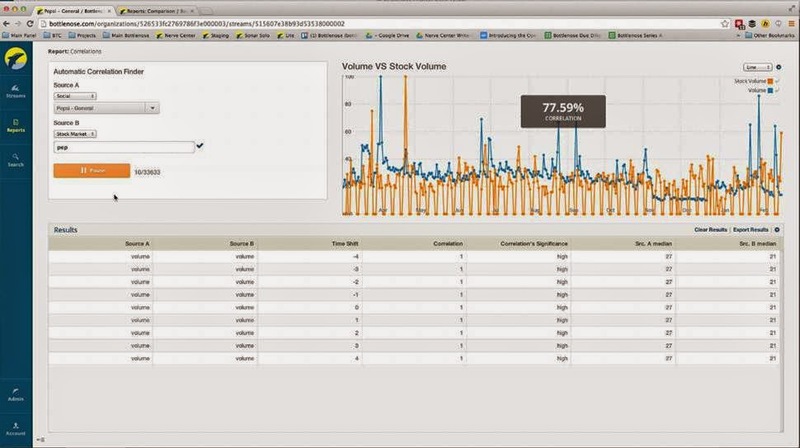 Bottlenose builds a time line tracking more than 150 metrics per entity, such as cumulative sentiment, audience size, influence scores, and demographics. Software agents constantly scan this data for trends, which could include connections, correlations, overlaps, clusters, or other relationships. When the system finds emerging trends that appear to be more than statistical noise, it highlights them in reports. • Actions. Automated alerts for new trends are high on the Bottlenose agenda, but hadn’t been released when we spoke in March. What users get is a variety of interfaces that let them select a given topic, see relationships and what’s trending, and dig into as much detail as they want – all using real-time data. Key capabilities include seeing connections among topics, seeing the volume of messages and trends in sentiment, analyzing audiences demographics, and comparing statistics for two entities such as competing brands or media channels. Practical applications include identifying the most important influencers on a given topic, finding the most effective hash tags for social media, assessing advertising impact, and buying more effective media. The underlying technology for all this involves a variety of tools, some proprietary. The company calls its core processing stack "StreamSense" and says it uses several open source technologies including the Cassandra distributed database and Elasticsearch real time search and analytics engine. Although StreamSense is a platform that could be used for many purposes, the company so far has only offered it in conjunction with the Bottlenose trend intelligence application. Of course, this platform potential is one reason I find Bottlenose so intriguing. (The other is, it's just plain cool to work with so many kinds of data in such volume so quickly.) Bottlenose is certainly not offering a Customer Data Platform, since its system is an application, not a central database available to external applications. I'm not even sure that StreamSense meets the operational requirements for a CDP database, which have less to do with real-time analytics than easy access and flexibility. But I do know that CDPs deal with higher data volumes and more varied structures than conventional databases can support, so I'm keeping an eye out for alternative technologies that might be better solutions. Bottlenose might just have one. 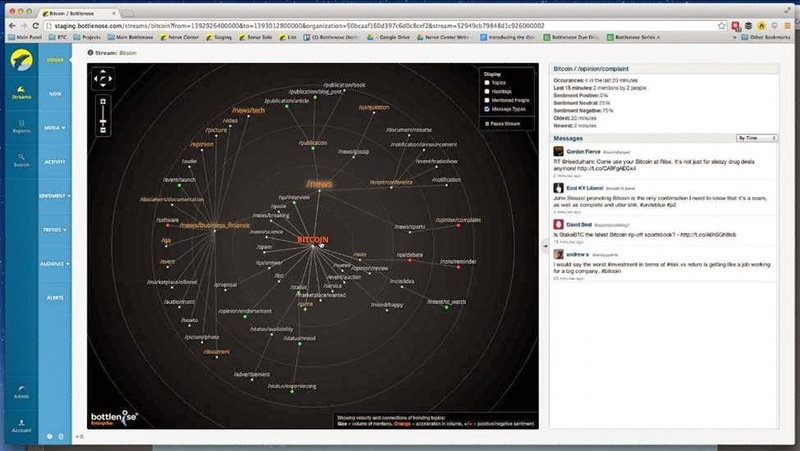 Bottlenose was founded in 2010 and launched its original social media dashboard in 2011. It has expanded beyond the social listening category with its enterprise product, which adds TV and radio to social activity. Pricing starts at $200,000 to $500,000 per year, although some deals are larger.